Sorry about the whiny birthday post yesterday, but I really was feeling down and homesick. As is usual, a new day brings new perspective. I realize that I have many many things to be thankful for. All around me there are positive things happening- my other best friend Lisanne has a brand new baby to love and raise. I have a great job as librarian at a primary school. Dev graduates in a few months. I could go on and on. After all the crying and carrying on, Dev put me back together and took me to dinner at the golf club. 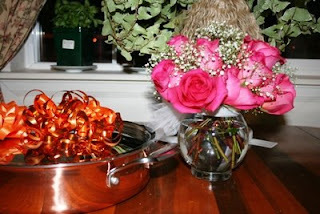 When we came home, I found roses and a brand new 12 inch, French copper skillet. It made me feel guilty for feeling so depressed.